The pre-conference tour is sold out. All seats on both buses are filled. We will NOT be able to accommdate walk-in requests for the tour. The pre-conference tour will be Monday, July 27, 2015. The tour will leave Union Station at 9:00am and return by approximately 5:00pm. The tour will visit three locations featuring a wide range of technology. Please note: these stops and times are subject to change. Bus transportation, lunch, and beverages will be provided. ATTENDEE NOTE: The end of July is a very hot and humid time of the year for St. Louis. Please dress for the weather including comfortable shoes (No open toe, sandals or flip flops) as there are uneven walking surfaces with some possible slip/trip hazards. Lange-Stegmann Company began as a progressive supplier of commercial fertilizer in 1926, and is still breaking new ground as a service provider to the fertilizer industry. Strategically located at the northernmost port on the Mississippi River open to barge access year round, the Lange-Stegmann fertilizer import terminal is positioned for efficiency. High volume storage capacity, enables LSCO to continuously feed fertilizer product to the country’s agricultural heartland in the most cost-effective manner possible. We will also have demonstrations from several vendors of automated soil sampling equipment on the grounds of Lange-Stegmann. The group will be divided into two and each group will get to see the terminal and demonstrations in turn. Tour of the Fertilizer Transload Facility including main office, Dome Storage, Covered Salt Storage Piles, St. Louis Urea Center, UAN Tank Farm, River Dock and Rail Loading Tower. The tour will feature the St. Louis Urea Center where the guests will get a close up view of storage and our high speed load rail and truck load out. There will be a number of automated soil sampling vendors at InfoAg this year and the first stop allows us to get a short demonstration of some of these machines. Sydenstricker John Deere Dealership includes ten stores in north east Missouri. 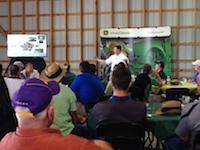 Last year they welcomed the InfoAg Tour with a wonderful lunch, informative presentations, and time to learn more about Deere precision equipment with a full range of tractors, combines, and implements on display. 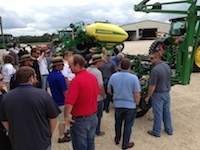 Presentations: we examine one of the most discussed topics around precision agriculture today; farm operation data. How do you analyze it? How do you share it? How do you mold it into profitable decisions that can safeguard your investments for future generations? There will be presentations on the service role of the dealer as as advisor for your business, your financial goals and your unique operation. Equipment: Learn about the latest planting technology from John Deere: ExactEmerge™ Row Unit: 10mph planting that offers accurate singulation, population, spacing, and uniform depth, built to maximize productivity and yield potential. This patented technology delivers seed to the bottom of the trench at a rearward trajectory that truly matches the ground speed of the planter at any desired population. The technology provides precise seed placement in both corn and high-rate soybeans. Drones will be featured at our final planned stop of the day. UAV vendors will demonstrate their products at the airfield. We'll get to see several UAVs in action and may have some additional tools to show. The Spirits of St. Louis R/C Flying Club will once again host the InfoAg tour for a demonstration of UAVs. We will also have additional demonstrations available. senseFly Ltd is a Swiss company. We develop, assemble and market autonomous mini-drones and related software solutions for civil professional applications such as accurate mapping of mining sites, quarries, forests, construction sites, crops, etc. Sky Imaging Mapping Data makes FAA certified (STC) pods for Cessnas to image 60,000 acres per day at 70% overlap with 5 inch GSD. NIR (Near Infrared) Canon 6D or 51 MegaPixel 5DS can acquire all three NDVI bands for as little as $.04/acre.